Most enterprises operate within a complex and ever-changing context. To ensure that requirements keep pace with changing context, users’ feedback is advocated to ensure that the requirements knowledge is refreshed and reflects the degree to which the system meets its design objectives. The traditional approach to users’ feedback, which is based on data mining and text analysis, is often limited, partly due to the ad-hoc nature of users’ feedback and, also, the methods used to acquire it. To maximize the expressiveness of users’ feedback and still be able to efficiently analyse it, we propose that feedback acquisition should be designed with that goal in mind. 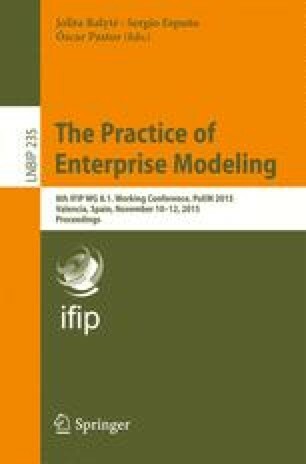 This paper contributes to that aim by presenting an empirical study that investigates users’ perspectives on feedback constituents and how they could be structured. This will provide a baseline for modelling and customizing feedback for enterprise systems in order to maintain and evolve their requirements. The research is supported by a European FP7 Marie Curie CIG grant (the SOCIAD project) and Bournemouth University through the Graduate School PGR Development fund.